St. Jean-de-Luz, France. I like to eat fish, but until recently I didn’t feel comfortable cooking it or shopping for it. My idea of a fish dinner was incinerated salmon steak with a squeeze of lemon. On the rare occasions when I prepared a lobster in my Brooklyn, N.Y. kitchen, what ensued resembled the scene from Annie Hall, in which the character played by Diane Keaton freaks out when she realizes what needs to be done. Each time I entered a fish store and saw all those glassy eyes staring out at me from the ice, you would have thought they were going to eat me, rather than the reverse. I suffered from fish phobia. 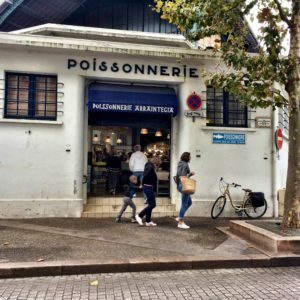 A recent visit to La Côte Basque – the area along the Atlantic seaboard in southwest France and northeast Spain – cured me of this malady. During the month that I have lived here, I have learned to make the perfect sole with cream sauce; pan-fried scallops with lemon butter sauce; and developed my own recipe for the Basque fisherman’s stew called marmitako. In the freezer of my rental house are containers of my homemade fish stock, lovingly prepared from the heads and carcasses of the fish I bought. And as I write this post I am preparing to make poached fillets of wild bass, or bar sauvage, as it is called here – for the second time. 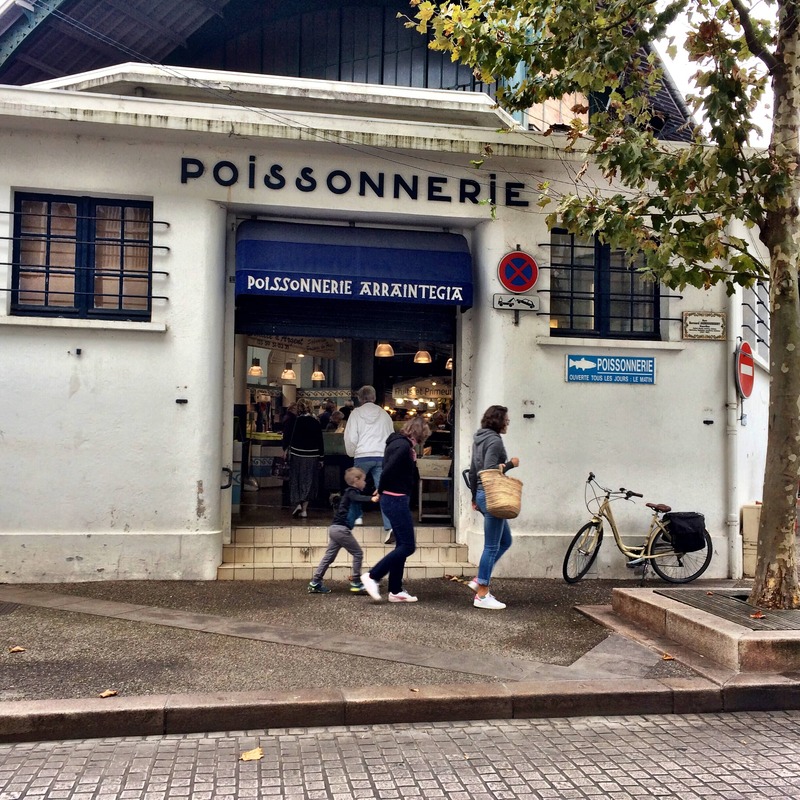 What got me into this comfort zone (and this is no fish tale) were daily visits to the poissonnerie, or fish store, in Les Halles – pictured in the photo above and to the left. It is a 15-minute walk from where I have been living, and seven different vendors maintain stands there. Most of the fish comes from North Atlantic waters, some of it is locally caught, and posted signs indicate what’s freshest each day. Especially on Fridays and Saturdays, when the market is busiest, the excitement is palpable. Some of it is about species that I didn’t initially recognize. And as usual, there were those glassy eyes to contend with. My first step was to observe how other shoppers reacted to a scene that left me feeling (for want of a better term) at sea. In this fish market there are no paper numbers to claim the order in which one is served, but courtesy is strictly observed. And until one decides on a purchase, the protocol is to demur. As I noted what was moving (in a manner of speaking), I consulted the Collins French dictionary app on my iPhone to translate fish names. Not feeling very adventurous at first, I started with a simple sole. For poaching it, court-bouillon, or fish stock, is an essential ingredient. Though one can buy it dehydrated, in cubes, I decided to make my own and asked the fishmonger for a fish head that I could use for the purpose. She produced a prize: a two-pound tête de merlu (hake head) that I simmered for 30 minutes in a cup of white wine and enough water to cover it. I added a sliced onion, a tablespoon or so of fresh lemon juice and six parsley stems (not the leaves, which will darken the stock). This recipe comes from what was to become my Rock of Gibraltar: Julia Child’s magnum opus, Mastering the Art of French Cooking, Volume 1. I have it on my Kindle. As I kept an eye on the simmering pot, skimming off the scum, I could hear Child’s voice, familiar to me from watching her popular PBS television series The French Chef, when I was a kid. Chapter V of her book, which has extensive instructions for cooking fish, makes readers aware of many variations on the theme. And in the process it invites them to improvise. 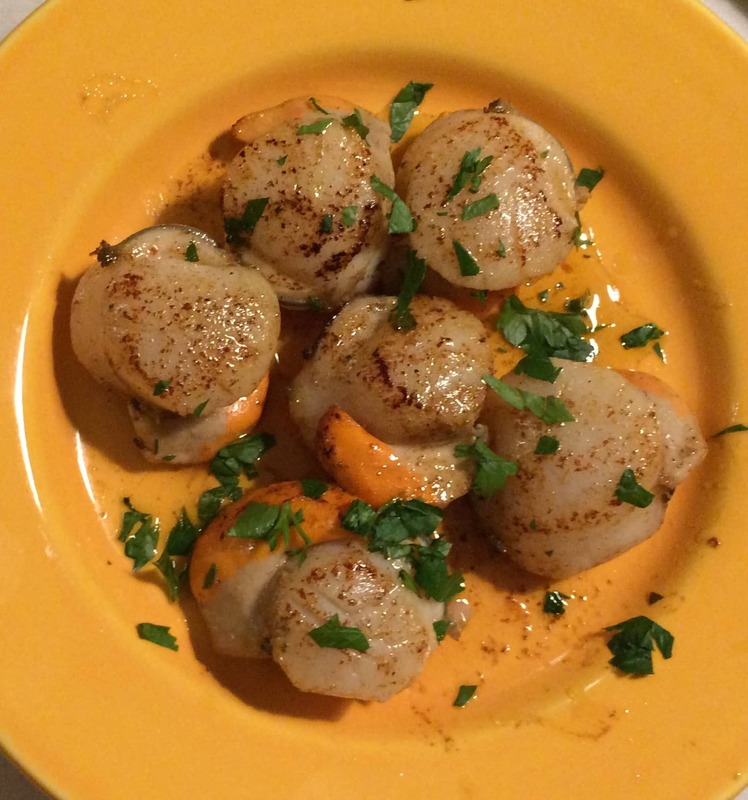 Pan-fried scallops with lemon butter sauce. After three weeks of practice, I had enough confidence to do that. By then I had learned to start the fish-poaching process on top of the stove before putting the pan in the oven. I could also make a respectable cream sauce. One day, when I had no onion for the court-bouillon, I substituted a sliced shallot. And I added a sprig of the thyme that sat drying in a basket on my dining room table. Child’s note about how to judge the freshness of fish gave me the courage to get more adventurous in the market, too. “If it is whole, its eyes are bright and full, not filmed, opaque, and flat. Its gills are bright red, its flesh firm to the touch, its skin fresh and glistening,” she writes. One day, while choosing a wild bass, I asked the fishmonger serving me to let me see the eye, which she had covered with her thumb. 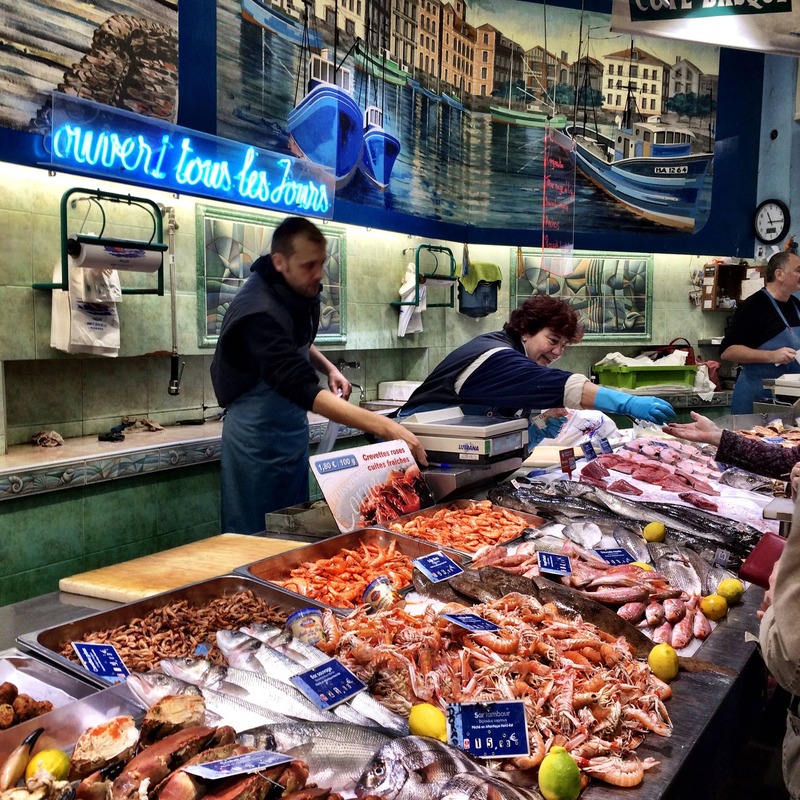 When she moved her finger, I noticed that the eye was cloudy – is this an old fishmonger’s trick? I refused that fish and chose a different one. Deftly she filleted it (there is no charge for this service) and separately wrapped the bones and head that I told her I planned to use for le bouillon. When I returned the following day and asked for daurade (sea bream), she recommended one with especially bright eyes and called my attention to the red gills. We had clearly reached an understanding. Except for the previous encounter, the fishmongers have been nothing but helpful. Patiently, they have fielded my questions about local specialties. On one trip to the market, after watching other customers swarm around a fishmonger slicing a part of the tuna labeled ventrèche, I inquired about how to prepare this rare delicacy. “Dans la poêle,” the fishmonger advised. “Pas de grasse.” In the frying pan. No grease — he pointed to the fatty marbling on what turned out to be the fish belly. You can salt it on the plate. Three small slices took only five minutes to cook, following these directions. The flavor was intensely gamey – it needed the salt. Afterward, I soaked up the liquid with a crusty piece of fresh baguette. Omega-3 fish oils reputedly have health benefits, and might promote glowing hair and skin, but as the fishmonger tried to warn me, this is an acquired taste. Marmitako, a Basque fisherman’s stew. In response to another question about tuna I got no uniform answer. 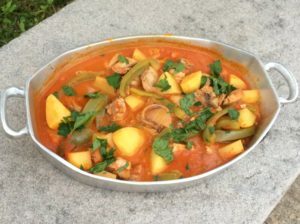 This one involved marmitako – the traditional Basque stew reportedly made right on the fishing boats after a tuna catch. 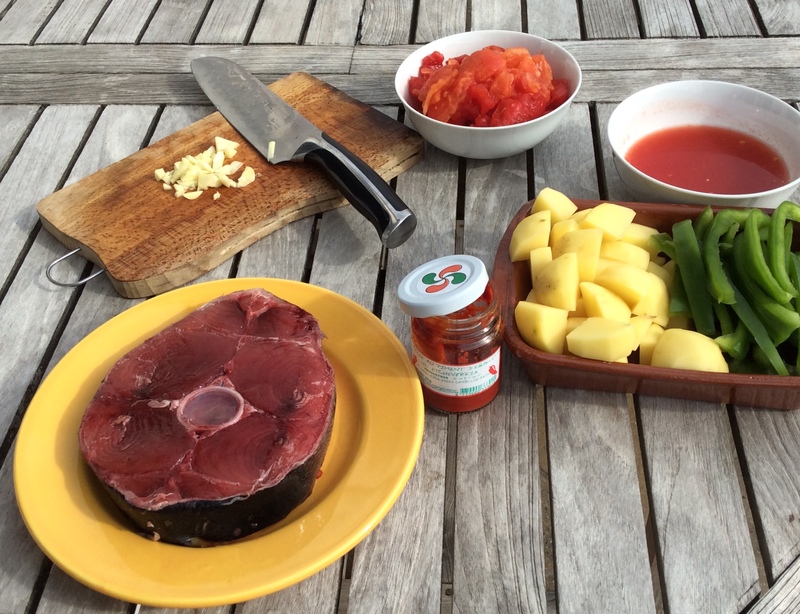 Several days, when there was a whole tuna being carved up at the market, I was inspired to try my hand at it. One thing I had noticed from researching this dish in Basque cookbooks – two of which I have on my Kindle (see note) and others that I consulted in bookstore browsing – is that no two recipes are the same. Though most call for tuna (bonito is sometimes substituted), potatoes and sweet green peppers (which grow abundantly in this region), not all call for garlic or onions. While some include hot red peppers, others rely on paprika to give the stew its spicy kick. They also diverge on whether – and, if so, when – to add any liquid. Each time I asked a vendor in the market which ingredients they used for marmitako, they looked at me like I was, um, a fish out of water. I’m guessing it’s analogous to someone with a heavy French accent going into a New York appetizing store and asking how to make brisket. That said, no one told me to peel and purée spicy red peppers – a step called for in some of the recipes I consulted. Based on the many jars of ready-made Espelette pepper purée that I saw on store shelves (€4.50 for 90 grams, or about $5.25 for slightly more than 3 ounces, was the going rate), I began to suspect the dirty little secret behind this recipe. One vendor in San Sebastián summed it up: “No one besides grandmothers has the time or patience to peel the peppers.” Though the purée was for sale at her olive counter, she told me she prefers to use paprika. After deciding there was no right or wrong way to make this dish, I took on the challenge of developing my own recipe. If it tastes good, you’ve done it right. This one-pot meal melds the flavors of tuna and vegetables in an immensely satisfying mix. The starch from the potatoes acts as a natural thickener. Using fish stock or wine, rather than water, during the cooking process, will give it an even richer flavor. To reduce the preparation time, you can partially cook the potatoes on the stove top or in a microwave oven; If you do that, be sure to add their cooking liquid to the stew. Peel, core and seed the tomatoes, working over a bowl fitted with a strainer so you can reserve the juices. Roughly chop the pulp. In a saucepan large enough to hold all the ingredients, heat the olive oil over a medium flame. Add the onions, then the garlic, and sauté until fragrant. Add salt and stir. Mix in the sliced peppers, followed by the tomato pulp, stirring briefly after each addition to incorporate. Cut the potatoes into chunks and add them immediately to the pan, stirring to coat with the tomatoes. Bring to a simmer. Add the tomato juices, pepper purée and enough of the water, wine or fish stock so that the potatoes do not stick to the pan as they cook. Continue cooking and adding liquid, if necessary, until the potatoes feel soft when poked with a fork. The dish can be prepared ahead of time up until this point and set aside for a couple of hours. Add the tuna, mix gently with the other ingredients, and add a bit more liquid if it is necessary. Continue simmering for about 5-7 minutes until the tuna is fully cooked. Espelette pepper purée is available in the U.S. online or at specialty stores. I like the one by Pascal Massonde, though there are many other brands. Most have a bit of sugar and vinegar added, so be sure to taste it before adding it to your stew. Barrenechea, Teresa with Mary Goodbody, The Basque Table: Passionate Home Cooking from Spain’s Most Celebrated Cuisine, The Harvard Common Press, 1998. Raij, Alex with Eder Montero and Rebecca Flint Marx, The Basque Book: A Love Letter In Recipes from the Kitchen of Txikito, Ten Speed Press, 2016.